The Arkansas Senate race is a dead heat between Democratic Sen. Mark Pryor and Republican challenger Rep. Tom Cotton, according to a Washington Free Beacon poll of Arkansas voters conducted this week. Forty-five percent of respondents said they support Pryor while 43 percent said Cotton. The freshman Republican congressman officially launched his Senate bid against Pryor, a two-term Democratic incumbent, on Aug. 6. Cotton has an advantage with Independents, leading Pryor 48 percent to 38 percent, while Pryor leads with female voters, 51 percent to 37 percent. "Congressman Cotton begins this marquee race poised to mount a formidable challenge to Senator Mark Pryor. Pryor's two point lead is within the survey's margin of error and has him well below the 50% mark," said Kellyanne Conway, whose firm the Polling Company, Inc. conducted the survey on behalf of the Free Beacon. "Cotton does respectable among Independents and younger voters. The traditional gender gap is present, with men favoring the Republican and women favoring the Democrat." Although Pryor’s job approval rating is above water at 51 percent, the poll does indicate some challenges for his campaign. Half of respondents say Pryor’s 2009 vote in support of Obamacare makes them less likely to support his reelection; just 40 percent said the vote made them more likely to vote for him. There are also signs the atmosphere in Arkansas has grown less hospitable to Democrats as President Barack Obama’s popularity has nose dived in the state. Just 42 percent of respondents approve of Obama’s job performance, while 57 percent disapprove. Fifty-two percent of respondents said Pryor’s support for the president’s policy agenda makes them less likely to support his reelection, and 41 percent said more likely. "The key to a Cotton victory lies in his ability to convince Arkansans that Pryor's votes for Obamacare and the stimulus are against their interests," Conway said. Still, Pryor maintains a strong reputation as a supporter of gun rights, and those numbers do not appear to be impacted yet by his support for an assault weapon ban. A plurality of respondents also said Cotton’s vote against the farm bill would make them less likely to support him. Analysts said the poll highlights the difficulties faced by Pryor, who is considered one of the weaker Democratic candidates in the 2014 Senate races. "The poll underlines what we all know — this is a toss-up race and one of the GOP's best chances for a seat pick-up against a Democratic incumbent," said Larry Sabato, director of the University of Virginia Center for Politics. 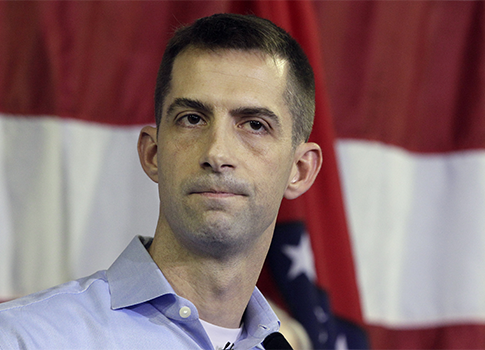 "Cotton was the one the Republicans wanted to run against Pryor, and this poll shows why. No incumbent wants to be in a tie starting out with a challenger, but a lot can happen in the 15 months remaining." The poll also gave a preview of Arkansas voters’ views on 2016. Among Democratic respondents, Hillary Clinton is at the head of the pack for presidential candidates, with 59 percent support. Vice President Joe Biden is the only other potential Democratic candidate who received double digits, at just 14 percent. Among Republicans, Sen. Rand Paul (Ky.) leads with 21 percent support, with Sen. Marco Rubio (Fla.) close behind at 17 percent. Sen. Ted Cruz (Texas), Gov. Bobby Jindal (La. ), Gov. Chris Christie (N.J.) and Gov. Scott Walker (Wis.) each receive below 10 percent. While Clinton crushes her Democratic competition, her advantage narrows significantly when she is placed head-to-head with potential Republican challengers. A Clinton vs. Paul matchup shows the former secretary of state leading 48 percent to 45 percent, within the poll’s margin-of-error. In a face-off between Clinton and Christie, Clinton leads 44 percent to 42. "Hillary Clinton is a former first lady of the state and the nation who ought to be able to surpass 50 percent in one of her "home" states among relative newcomers," Conway said. "Arkansans are not yet sold on her, with less than half of them committing to a Hillary candidacy against two very different Republicans, Sen. Rand Paul and Gov. Chris Christie." The poll, which surveyed 600 Arkansas registered voters from Aug. 6-7, was conducted by the Polling Company, Inc./WomenTrend. The margin of error was +/- 4 percent. This entry was posted in Politics and tagged Arkansas, Congress, Mark Pryor, Tom Cotton. Bookmark the permalink.